Patchouli Soap WITH ALOE VERA is dedicated to dreamers everywhere. Close your eyes and imagine yourself in the exotic Far East, Victorian England or Haight-Asbury during the Age of Aquarius. Patchouli's distinctive scent is recognized in the world of aromatherapy for its calming, restful characteristics. Aloe Vera, known as \"the healing plant\", is infused into this fascinating soap creating an aromatic moisturizing cleanser for dry, chapped, sun-exposed skin. \"Soothes the body, calms the soul.\"
Grandpa is confident that you will enjoy his soap as generations have since1878. Times have changed, but our commitment to bring you the highest qualitypersonal care products remains. Coconut oil, palm oil, purified water, vegetable glycerin, aloe vera gel, essence of patchouli. 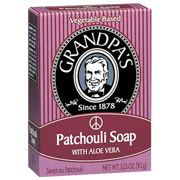 Patchouli W/Aloe Vera Soap - is shipped in a discrete, unmarked package. Orders are processed immediately and usually take about 3 to 5 working days to be received. We do ask that you try it for 2 to 3 weeks to feel the full effects. Any information received is used only for order processing and shipping purposes. Your information, such as e-mail address, will never be disclosed to a third party.